09-Feb-2012The confluence is located in the state of Campeche 25 kilometers south of Candelaria and 22 kilometers southwest of the ancient Maya ruins of El Tigre. It is also about 4.4 kilometers north of Tabasco and 20 kilometers north of the Mexican border with Guatemala. This is a confluence we have wanted to do for several years. Prior to setting out we located the confluence on Google Earth and took some notes on potential routes. As it turned out, the confluence was easily reached by a combination of paved and dirt roads. Our day started out in Xpujil, Campeche. It was about a 3 1/2-hour drive followed by a 15-minute walk to the confluence. We traveled on Mex 186 through Escarcega and then on Mex 221 to Candelaria. From Candelaria we traveled on local roads. The last 7 kilometers were on unpaved ranch tracks. We arrived at a ranch and presented the owner with the Degree Confluence Project landowner letter and explained the purpose of our visit. He was gracious and gave us permission to go onto his property. He also showed us a shortcut to a very good rock road for our return to Candelaria. Armed with permission to proceed, we drove another 1.1 kilometers on rough ranch tracks. At this point we would need to walk. 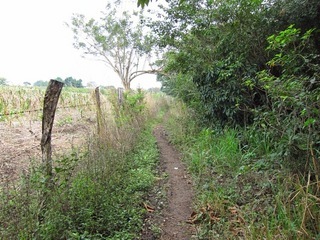 We walked the edges of cattle pastures and farm fields for about 650 meters and crossed through a barbed wire cattle fence. The confluence was a short 30 meters south into the forest. As mentioned above, the confluence itself is on a ranch and lies within a secondary forest. The ranch has a combination of crops and cattle pasture. Most of the surrounding area is used for raising cattle. The terrain is somewhat flat with a few rolling hills. There are also several very large lagoons in the area. The region could be could be characterized as rural and agricultural but not remote. Our map showed a bridge over the Rio Candelaria at the town of El Tigre, so we decided to investigate. On the way we stopped and talked with members of the Mexican Army who did not know if there was a bridge over the river. We can report there is no such bridge. Interestingly, the locals still use 30 year old dugout canoes on the river as well as modern boats. The river itself is quite beautiful and full of wildlife.